Coppell High School senior Pierce Woodall goes up to spike the ball during the match at CHS Arena against Waxahachie on August 11th. The Cowgirls beat the Waxahachie High School Indians, winning 2 out of 3 sets. 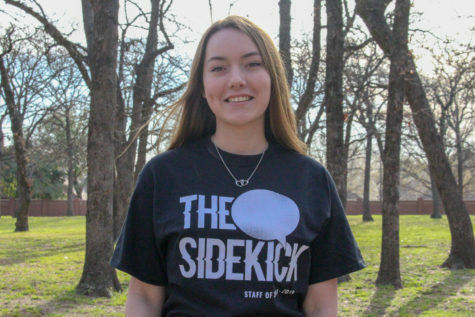 The Hebron volleyball team is used to winning, but the 3-time consecutive state champions met their match on Tuesday night. 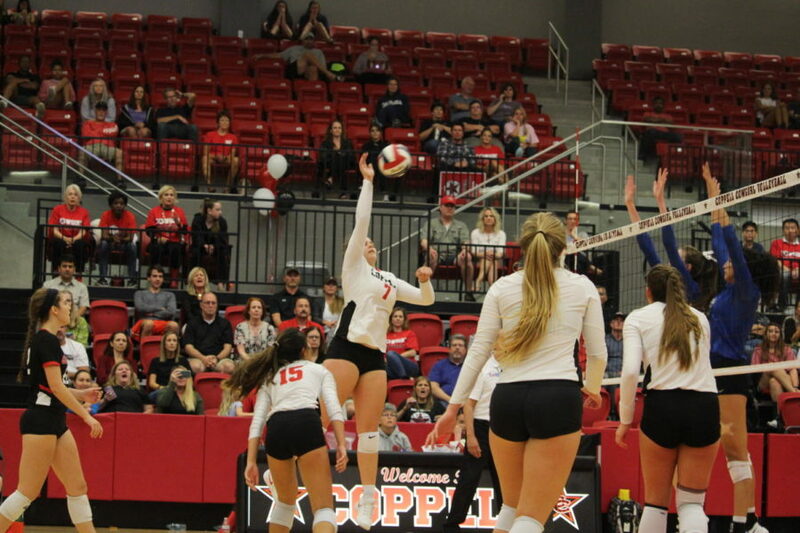 Coppell reminded the Lady Hawks that the Cowgirls have a tradition of their own. Coppell defeated Hebron 25-12, 25-14, 24-26, 25-17 at the CHS arena. Hebron has won the past three Class 6A state titles. Coppell senior choir member Neha Dharmapuram sang the National Anthem as parents, parents, players and guests paid respects to the victims of the 9/11 attacks 17 years ago. The Coppell student section had a great turnout, supporting the players by being loud and waving hand towels. Small hand towels that sport the Coppell volleyball logo were distributed at the entrance to the student section. Many Coppell middle school volleyball players were in attendance to the game as part of Middle School Night. The middle school players had the chance to pass around volleyballs with the JV and varsity teams before varsity started warming up for the game against Hebron. Coppell starting players had the chance to fully showcase their talent by playing almost the entire game. Senior setter Stella Yan, Woodall, sophomore middle hitter Madison Gilliland, junior libero Maci Watrous and senior outside hitter Amarachi Osuji played the entire match without substitutions. Woodall had 24 kills, six digs and one ace. Osuji had 15 kills and 21 digs, Gilliland had 15 kills and three blocks, Yan had 54 assists and 11 digs and Watrous had 18 digs. The Cowgirls return to play Nimitz at home on Friday, September 14th at 6:30 PM.